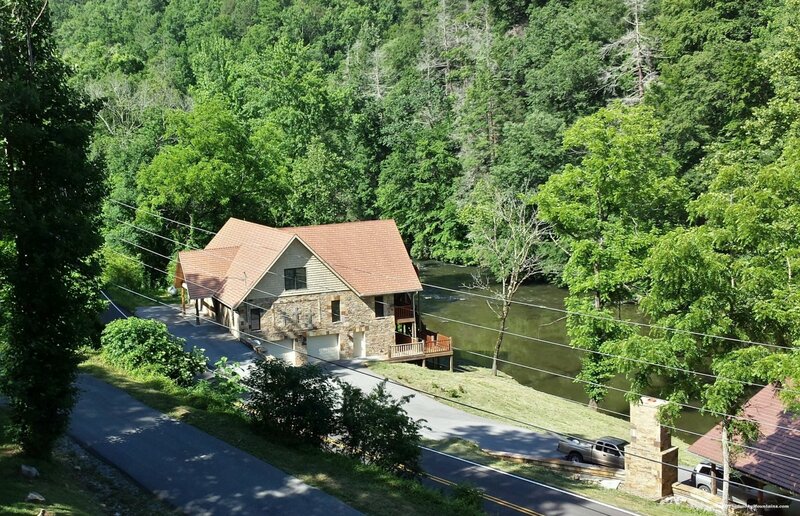 How about a 5-bedroom luxury rental cabin in the Smoky Mountains on the banks of a river, with room and amenities to sleep up to 21 people in comfort, and with a private view of the river? Sounds like Riverside Lodge, tucked away on the Little Pigeon River, a scenic 10 miles from the bustle of Gatlinburg and 12 miles from Pigeon Forge. But you may not want to run to town too often with all that this cabin has to offer. Laze on one of the the three decks, or in the private hot tub on the upper deck. Go swimming in the river from your own private landing. Step over to the cabin’s riverside picnic pavilion to gather by the fire pit or have a cookout. Life indoors is hardly less spacious in Riverside Lodge, and the living is purely recreational, from the large home theater with sofa seating to the pool table. And there’s air hockey, foosball and arcade games keep the restless young ones and the young at heart plenty occupied. The large open plan kitchen, dining area and living room allow a lot of people to mingle and hunker down or hide away depending on mood, with TVs and fireplaces for gathering points, and large bedrooms with couches to hang out in too. Riverside Lodge is a self-contained experience for a family reunion or group to share in comfort and fun. Free access to our deluxe conference and wedding facility is also included. Plenty of parking with easy vehicle access opens up all the options for a great stay in fantastic surroundings, with the non-stop action of town less than 20 minutes away. The cabin is also handicapped-accessible. Click here to check availability and book Riverside Lodge for your own vacation! Or call 855-84-CABIN, open 24 hours!